CBDT issued all income tax return form for financial year 2017-18. ITR 6 is the latest form which issued by income tax department. All other ITR ITR-1,ITR2,ITR3, ITR4S, ITR5 and ITR7 are issued sometime back. 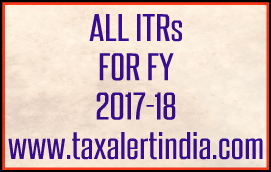 So we include all the income tax return form ITRs for financial year 2017-18 in one place for ease to download. CBDT only issued ITR6 in java format and not the excel format. However other ITR form are issued in both in java and excel format.